Triangles are so 2017. Squares are the future. 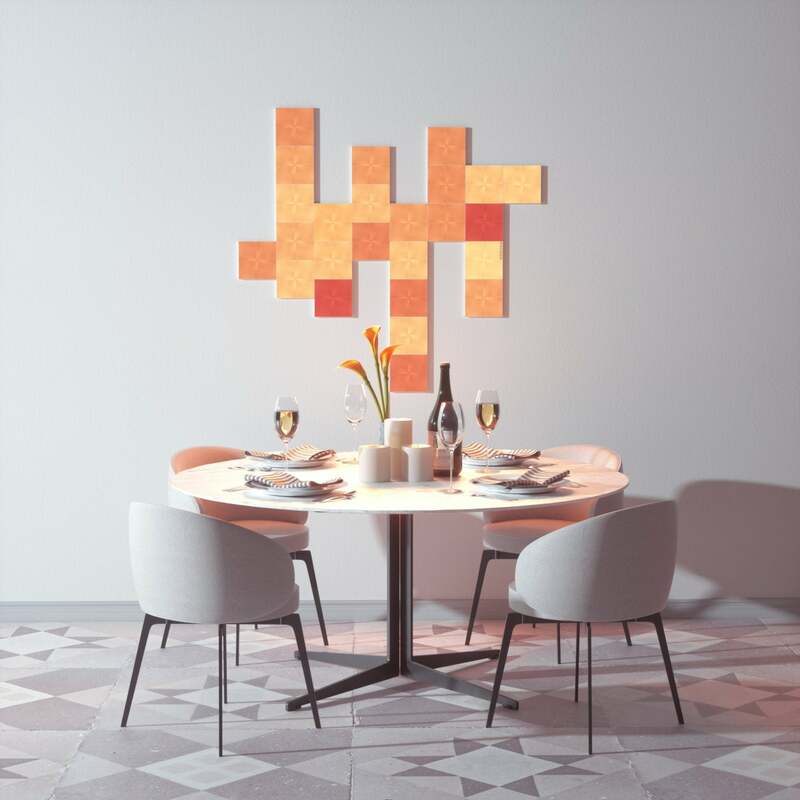 Nanoleaf hit the scene last year with its triangular Light Panels (formerly known as Aurora), and it hasn’t let up when it comes to innovating in the quirky world of wall-based accent lighting. In addition to adding a music module and an oddball remote control to its Light Panel kit, the company is now pushing beyond the triangle and into the future, which is to say, the square. For those unfamiliar, Nanoleaf’s panels are smallish plastic units (the Canvas squares are 6x6 inches) that are sold in packs of nine. You lay these squares out in whatever configuration you want, using small “linkers” to connect them to each other. New to the Canvas is the inclusion of a “control square,” which has six small buttons on one quadrant. These buttons are used to turn the lights on and off, change color scenes, and activate Rhythm modes, the aforementioned music synchronization feature which is only available on the Light Squares as an add-on, and which lets panels pulse and change color in time with ambient audio in the room. Create your own wall art out of illuminated Canvas squares. Functionally speaking, Canvas is similar to the Light Panel kit. Once you lay out your design and affix it to the wall, setup is performed via a quick HomeKit scan and the Nanoleaf mobile app. 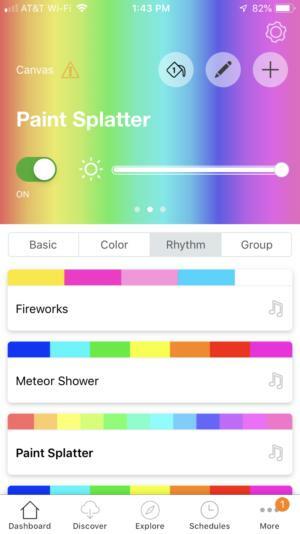 Recent changes to the app make it easier than ever to select and change lighting scenes, whether you want a solid block of vibrant color or a soothing wave of cool blue that moves in time with your tunes. You can also download additional scenes created by other users through the Discover section of the app and load up your panels with a new look in seconds. If you also have Light Panels, you can integrate your scenes so that both kits work together, or have each setup do its own thing, all through a single app. Use the mobile app interface to select colors and special effects for your Canvas squares. While the newly integrated Rhythm mode is fun, the biggest addition to Canvas is the inclusion of touch features in each panel. You can get a sense of this through the aforementioned control square and its touch-sensitive buttons, but Nanoleaf promises even more fun ahead, with features like touch games that make your lighting interactive. While early games like Whack-A-Mole and Memory are mildly amusing (though poorly documented), I was more excited to use touch features to turn the system on and off, change brightness, and so on, all by just tapping panels. In addition to that, moving the small bank of dedicated controls directly to the panel (instead of putting them on a separate unit that juts out a bit, as it does on the Light Panels) is a great decision and makes the whole affair a lot more physically attractive. On the other hand, as with the Light Panels, the power cable still dangles from the kit in a rather unappealing fashion. Some of Nanoleaf’s press photos show off some amazing configurations of what appear to be more than 100 panels all interconnected into a single unit. That’s actually possible, but note that you need one power supply for every 25 panels you set up. A single control square, however, can handle up to 500 panels at once. (The old triangular panels were limited to 30 panels max.) That said, a 100-panel rig will run you about $2,000, so it may be prudent to temper your design plans for now. 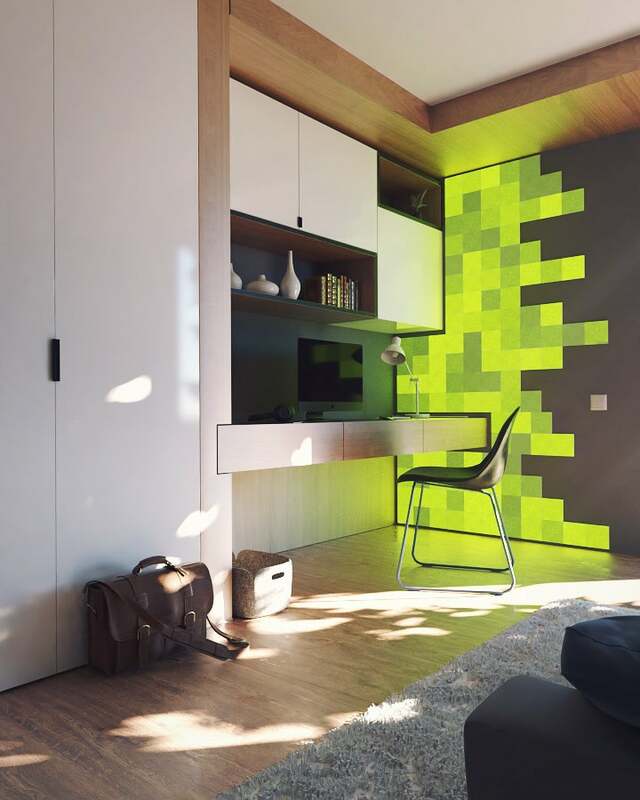 This story, "Nanoleaf Canvas Smart Light Squares review: Nanoleaf’s wall lighting goes touch-sensitive" was originally published by TechHive. Nanoleaf’s new wall lighting panels are more versatile than ever, but the gear isn’t cheap.